These are the best peanut butter cookies on the planet. I promise. 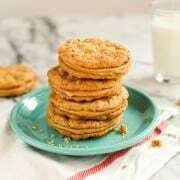 Buttery Peanut Butter Sandwich Cookies, a recipe from Tom Douglas. 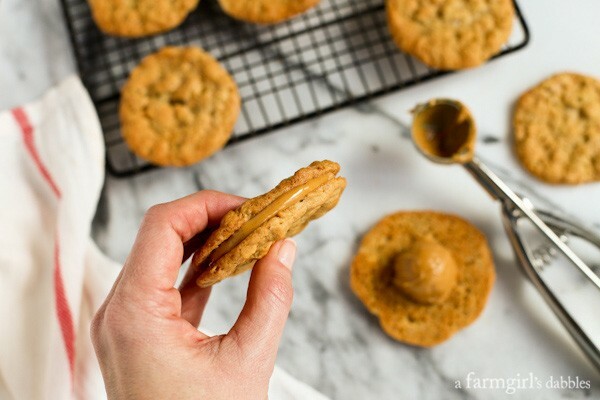 If you think you’ve already had the best peanut butter cookies in the world, I challenge you with these Buttery Peanut Butter Sandwich Cookies. 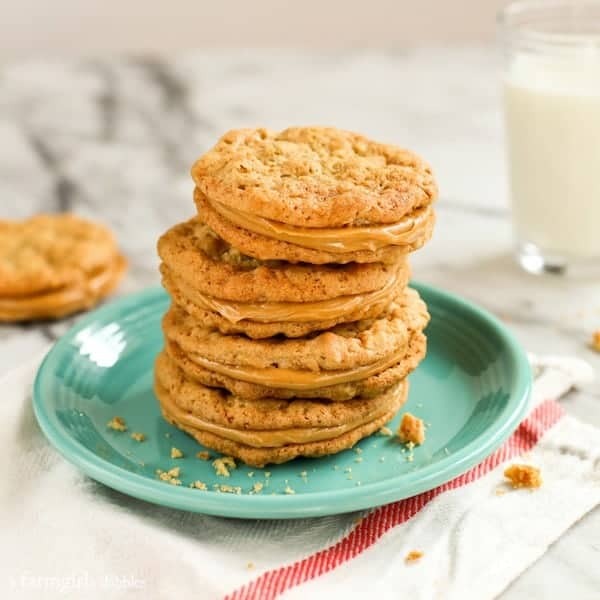 They are pure peanut butter heaven, in the most buttery, delicious way! My first experience with these peanut butter sandwich cookies was last summer when my family visited Seattle for the first time. After quite a bit of Seattle dining research, it was evident that any and all restaurants by Tom Douglas needed to be put on our list. I also knew that when we visited The Dahlia Bakery, I shouldn’t pass up my chance to try the best peanut butter cookie on the planet. And all those reviews weren’t kidding. The peanut butter sandwich cookies are killer. When I took my first bite, all I could mutter was “butteryyyyyyyy”. When I found the recipe within the pages of The Dahlia Bakery Cookbook, I just had to take one of the books home with me as a souvenir. The recipe is included in this post, printed with permission from Tom Douglas. 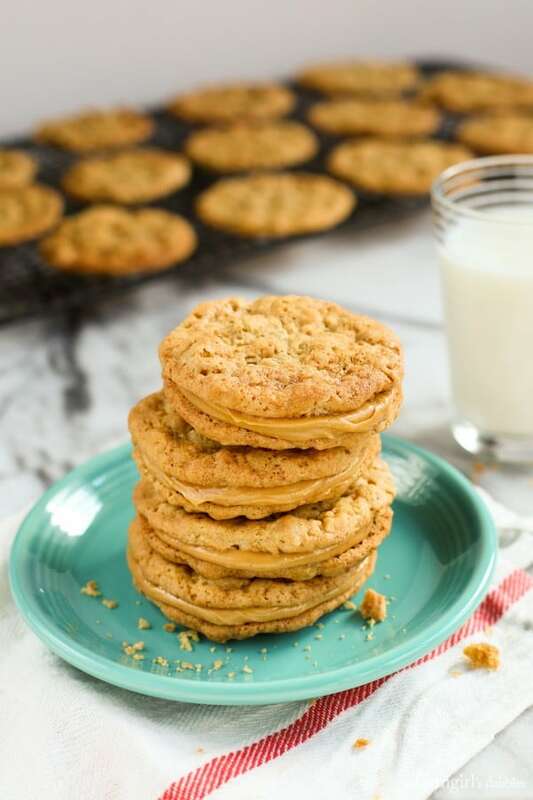 The cookie recipe utilizes two different kinds of peanut butter. Skippy creamy peanut butter makes the filling smooth and creamy. 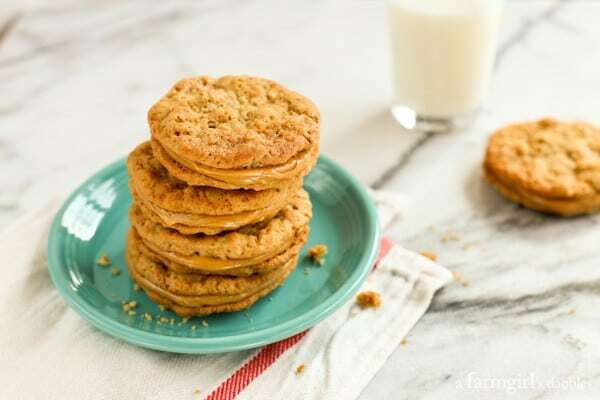 And a crunchy natural peanut butter is used for the cookie, giving it an awesome texture. Tom Douglas recommends Adams natural peanut butter, but I couldn’t find it in the stores I frequent. The dough is portioned and shaped with a cookie scoop, and then chilled for a couple hours. The baking directions are a bit quirky, as you set a baking sheet lined with chilled cookie dough inside another baking sheet to “double pan”. This ensures slow and even baking in the oven. It also means a slower baking process at home, especially when I own only two cookie sheets and they need to be cooled in between batches. Once the cookies have cooled, they are spread with the most luscious peanut butter filling ever, and “sandwiched”. These peanut butter sandwich cookies are richly flavored with peanut butter, with a noticeable saltiness that leaves me completely addicted. 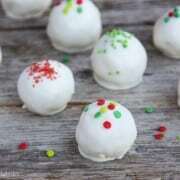 The cookies are perfectly soft, with the thinnest crispy exterior. And the sweet, buttery filling is beyond creamy. When you take a bite of a freshly made cookie, the filling squeezes out on the sides of your mouth. In this case, messy is just plain marvelous. A few things to note: The cookies served at Dahlia Bakery are a bit larger than mine. I just wanted a slightly smaller cookie for our enjoyment at home. The recipe I have included here reflects the smaller sized cookie. Also know that the shaped cookie dough requires at least 2 hours of chilling time before baking, so plan accordingly. 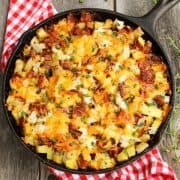 In a medium bowl, combine all the filling ingredients with a whisk. Cover and chill the mixture until you are ready to fill the cookies. In a medium bowl, sift together the flour, baking soda, and baking powder. Stir in the oats and the salt. Set the dry ingredients aside. In the bowl of an electric stand mixer with the paddle attachment, combine the butter, chunky peanut butter, and sugars. Cream on medium-high speed until very fluffy and pale, at least 3 minutes, scraping down the mixing bowl as needed. Turn the mixer speed to medium-low and add the eggs, one at a time, beating to incorporate each egg, and scraping down the bowl as needed. Beat in the vanilla extract. Add the dry ingredients on low speed in 3 to 4 additions and mix until just combined. Do not overmix. Remove the bowl from the mixer and scrape down the bowl with a rubber spatula, going all the way to the bottom of the bowl to mix in the dry ingredients well. Use a medium ice cream scoop to portion all the cookie dough into 1-tablespoon portions, placing the scoops on a parchment lined baking sheet. You should have about 70 cookies. (You can place all the cookies close together for the chilling step – you will space them for baking later.) Chill the scooped cookies for at least 2 hours or longer. When you are ready to bake the cookies, preheat the oven to 375°. Arrange 12 cookies, spaced evenly apart, per parchment lined baking sheet. (Note: Do not flatten the cookies; they will flatten as they bake.) Set the baking sheet inside another baking sheet to “double pan”, and place it in the oven. Bake until evenly golden, about 12 minutes total, rotating the pan halfway through the cooking time (very important!). Remove the pan from the oven and cool on a wire rack about 10 minutes before removing the cookies with a metal spatula. Allow the cookies to cool completely before filling them. And be sure to cool the baking sheets between batches before re-using them. To make a cookie sandwich, turn one cookie flat side up and spread with 1 tablespoon of filling. I used the same medium 1-tablespoon ice cream scoop. If you like a fuller sandwich cookie, you may need to make a bit more filling. Top with another cookie, flat side down, pressing gently. Repeat until all the cookies are assembled into sandwiches. Printed with permission from Tom Douglas, with my adaptations included for smaller sized cookies. “The mountain is out!” I wonder how many times we heard that excited statement the day we rode to the top of the Space Needle, the centerpiece left from the 1962 Seattle World’s Fair. The skies were big and bright and sunny. And from certain vantage points in the city, one could catch glimpses of Mount Rainier to the south, looking quite stately in its cap of snow. 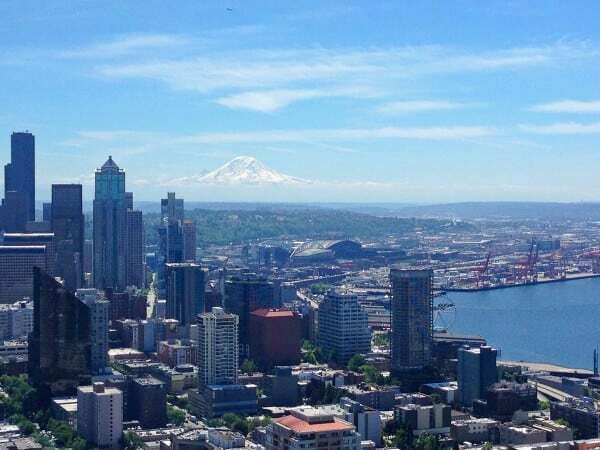 One magically incredible view was offered 520 feet up, at the Space Needle’s Observation Deck. We just happened to have made our lunch reservation for that day in the Needle’s revolving restaurant, SkyCity. We totally lucked out. Because the mountain was out! I had read a number of yay and nay reviews about the restaurant, and also the experience of the Observation Deck. But I just had a feeling it would be worth it for us. So I made a reservation for 6 (we invited my parents to join us for the week) a couple months ahead of time. It’s not inexpensive, I’m not gonna lie, but your dining reservation also gives you access to the Observation Deck (which isn’t cheap on its own, either) for “free”. While the restaurant revolved during lunch, giving us a floor-to-ceiling and 360° view of the Emerald City and beyond, we relaxed and soaked up the experience like the most precious gift. Our meals were very good and the staff was attentive. I’d do this again, definitely. To cap off our lunch, my mom ordered dessert for all of us. She had heard about a showy ice cream dish and wanted to surprise our girls with it. 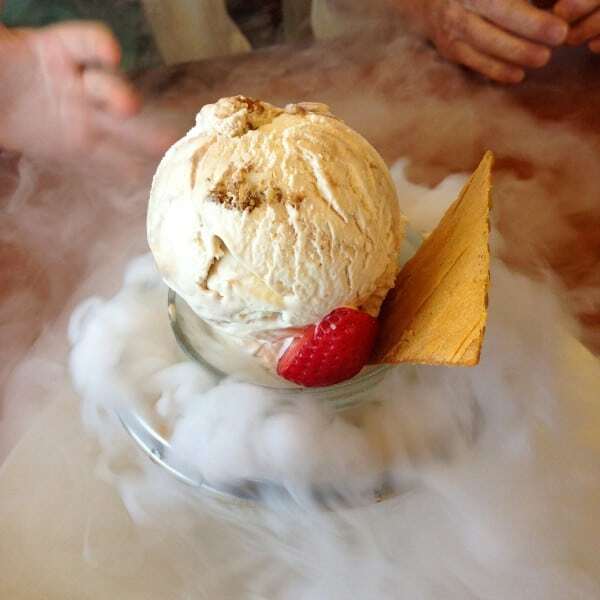 The dessert was impressive looking, a smoke-billowing show piece. It was fun. 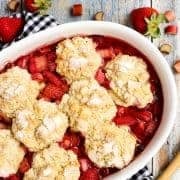 Besides, every meal on vacation deserves a bite or two of dessert! If you know you want to eat at SkyCity, and you’re visiting during high travel season, try to make a reservation as far ahead of your visit as possible. I was given limited dining availability two months ahead of time for our visit at the end of June. Sample some of the Needlicious Fudge in the Space Needle’s gift shop. I bet you’ll open up your wallet to take some home with you! To travel easily between the Space Needle and downtown Seattle, use the Seattle Center Monorail. The monorail, also built for the 1962 World’s Fair, was clean and easy to use. Right next door to the Space Needle is Chihuly Garden and Glass. 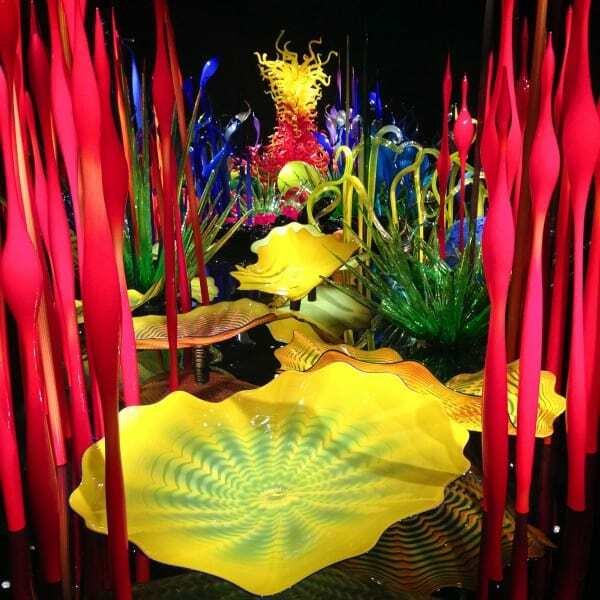 I’ve been enamored with Dale Chihuly’s glass blowing since I stood under a ceiling display of over 2,000 huge hand-blown glass blossoms at the Bellagio in Las Vegas, stunned at the gorgeousness. Mom and I were the only ones who paid admission to walk through the glass museum and gardens. I’m so glad we did. The art was colorful with a wide range of styles. Definitely impressive. 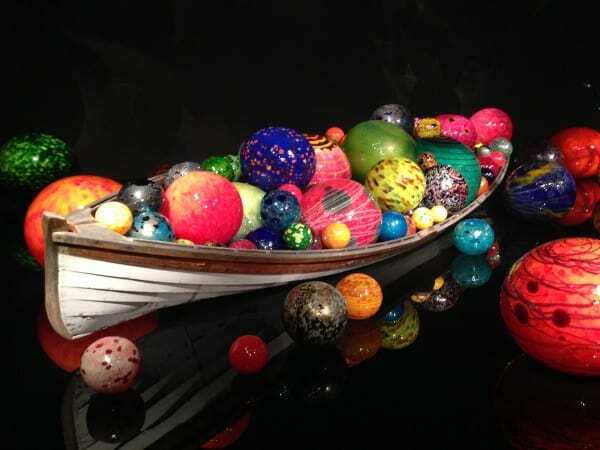 Those hand-blown orbs, above, are sitting in a life-size boat. My favorite spot of all was the 40-foot tall Glasshouse, the centerpiece of the lush gardens. 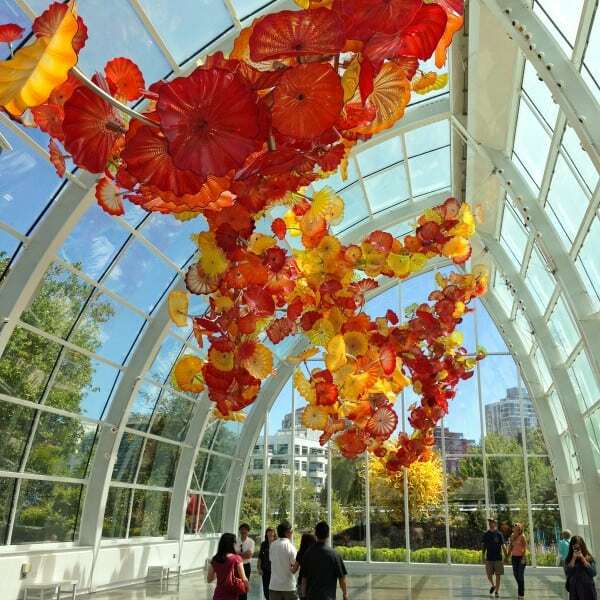 Made of red, orange, and yellow blossoms, the suspended glass is captivating. When you stand in the middle and gaze upward, you are reminded how close you are to the Space Needle. This might not be for everyone, I admit. My husband and girls weren’t all that interested, so they grabbed a snack and explored the area nearby while Mom and I enjoyed the glass art. Chihuly Garden and Glass is right next to the Space Needle. Plan to visit both of these on the same day. Again, the Seattle Center Monorail provided an easy way to get from this area to downtown. 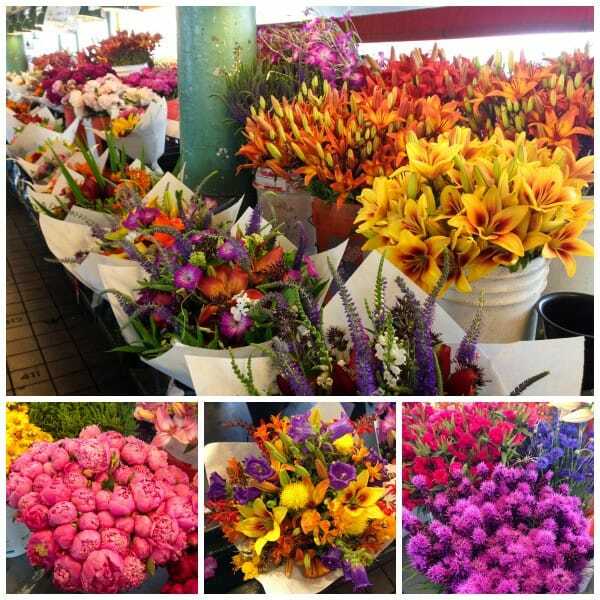 When visiting Seattle, you have to plan a trip to the Pike Place Market. If you have the time, I would even suggest a couple trips, at different times of the day. We found the experiences very different each time at this year-round farmers market. It’s a bit quirky and whole lot charming. I wish I had something like this within a few blocks of my home! 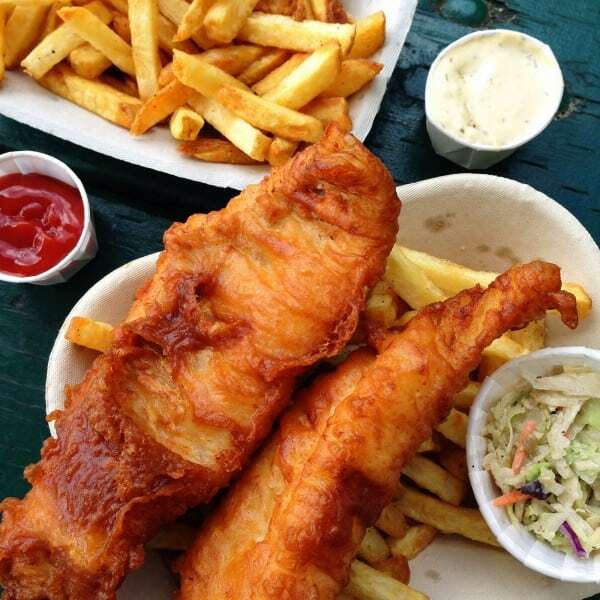 Being from the land-locked Midwest, I’m always fascinated with the fresh fish and seafood from areas that are blessed with delicious abundance from the ocean and sea. 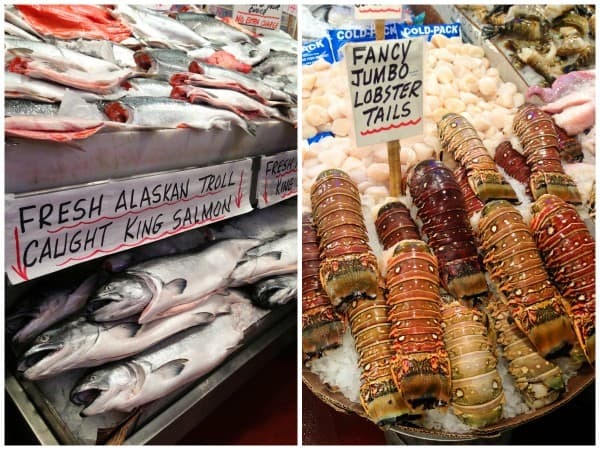 You’ll find several large fish markets at Pike Place Market. The flowers! I loved watching the women behind the counter creating gorgeous arrangements, picking just the perfect assortment of shapes and colors for each bouquet. The fresh produce was incredible, with multiple vendor stalls bursting with fruits and vegetables from local farms in the Pacific Northwest. 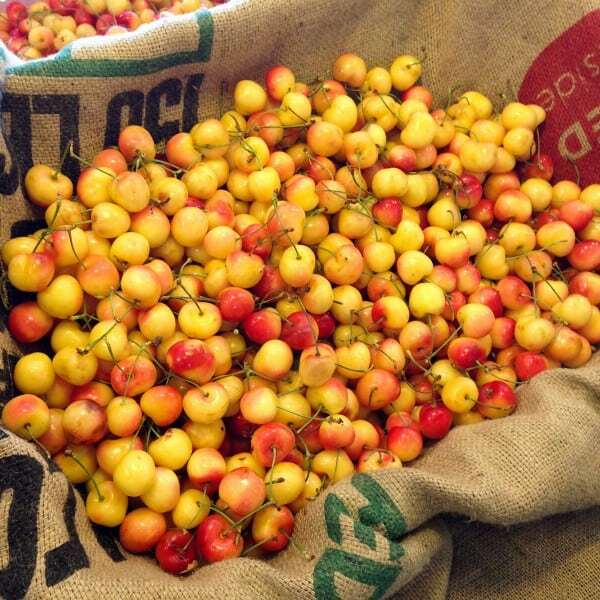 It was cherry season while we were in Seattle, oh lucky us! Fresh cherries were our treat of choice during the trip. From beautiful cherries to chewed and discarded gum. Hmmmm… Our crew of 6 had wide ranging opinions of the Market Theater Gum Wall, from “disgusting” to “cool” to being only mildly amused, we all agreed we were glad we made the effort to find it under Pike Place Market in Post Alley. Can you believe it’s a popular spot for wedding photography?! Our oldest daughter would be disappointed if I didn’t mention her first Starbucks Frappuccino. 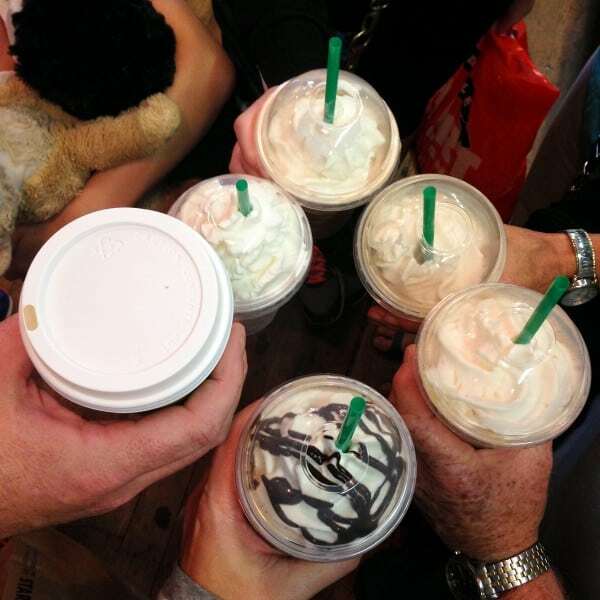 Yes, ever since the day she knew we were headed to Seattle for the first time, she said, “That’s when I’m going to have my first Starbucks, at the flagship store.” She enjoyed every last slurp of that long awaited frozen beverage, and a Frappuccino is now her treat of choice. Arrive early. Or late. If you visit from mid-morning through mid-afternoon, be prepared for a shoulder-to-shoulder crowd on the weekends during high tourist season. It’s a much less pleasant way to take in all the market has to offer. Bring some kind of tote bag with a comfortable strap to carry things you purchase. Grab a bag of hot, fresh mini doughnuts at Daily Dozen Doughnut Co. Stand in line (we never saw this place without a line) at Piroshky Piroshky for some traditional Russian hand-held pies. They offer both sweet and savory, in a wide variety of flavors. I loved watching the bakers creating these gorgeous pastries. They are works of art. If you’re looking to be entertained: The Pike Place Fish Market, at the corner of Pike Place and Pike Street, is known for their tradition of fishmongers throwing fish that customers have purchased, before they are wrapped. While the line can sometimes snake out the door and around the corner, Beecher’s Handmade Cheese is worth the stop. You can watch cheese being made in large vats (can see from the street) at this small shop, and there are free cheese samples and other delicious goodies. We picked out a variety of cheeses, some fresh cherries and peaches, and a bottle of wine and some crackers from DeLaurenti Specialty Food & Wine (in the market) for our dinner one evening back at the hotel. Perfection. If you’re a foodie, you can also visit the flagship Sur La Table store. The Seattle Great Wheel is fairly new to Seattle, only open since 2012. 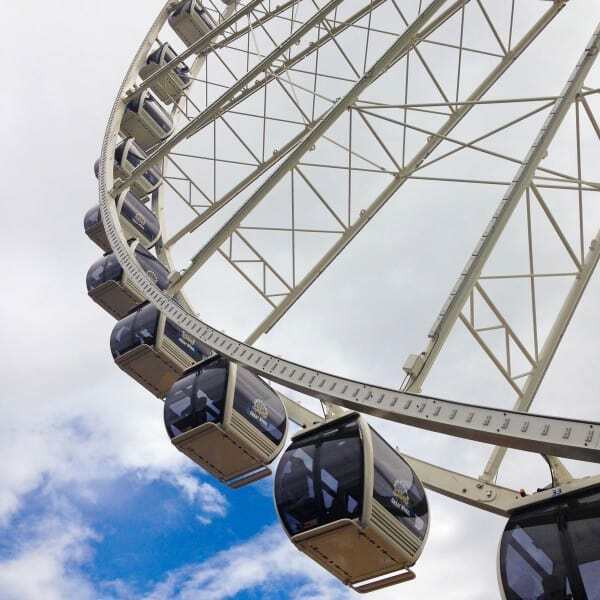 At 175 feet tall, the wheel extends nearly 40 feet beyond the end of the pier, over Elliott Bay. Plan to eat lunch or dinner in the area along the piers. There are plenty of restaurants. I enjoyed a small platter of fresh oysters overlooking the water at Ivers. We got around Seattle by foot, monorail, and modern streetcar. But we did rent a vehicle for a few days to take in some things outside the city. Boeing was one such stop, located just 25 miles north of Seattle in Everett, Washington. I have very little photos from this piece of our trip, though, as Boeing does not allow photos in their plant. We were able to view jets being assembled. And until you actually see this for yourself, it’s impossible to portray the massive size of the buildings necessary to construct these huge flying machines, much less the airplanes. We all thought this was a great way to spend a day. Very educational. You’ll never look at an airplane in the same way again. If possible, try to plan your tour on a weekday. We went on a Sunday, when the plant was not especially active. While we still got to see alot, I think the experience during the week, with active construction, would have been a bit better. Tours fill up. Plan ahead by reserving your tickets online. 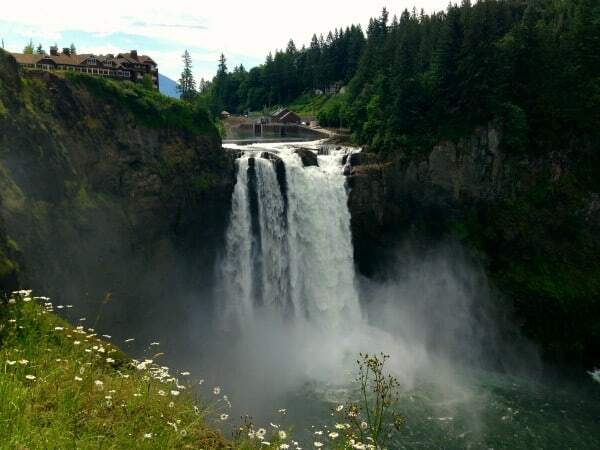 I had always seen pictures of Snoqualmie Falls, and knew that if we could fit in a drive, I wanted to see this place for myself. It’s located about 30 minutes east of Seattle and easy to get to. This waterfall is 270 feet tall, a rush of beauty sending its cooling, fine mist up to meet you on the observation deck. I highly recommend taking the path down to the lower falls area. 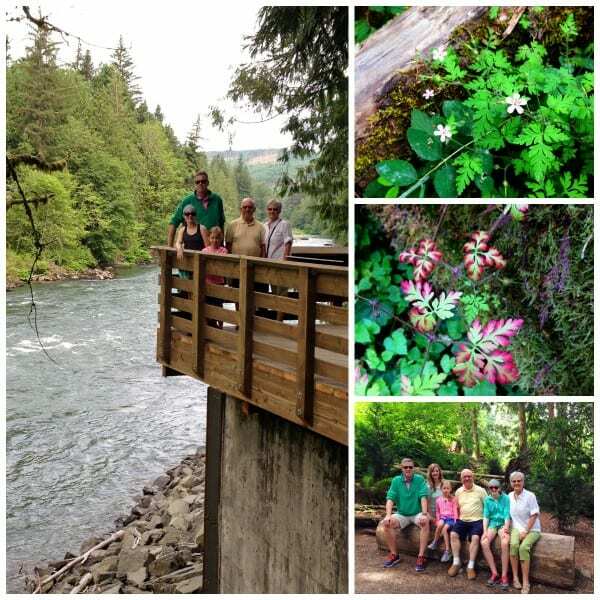 It was lush and thriving with beautiful Pacific Northwest flora. I had never seen mosses so big and lacy and gorgeous in all my life. Stop in at Salish Lodge that overlooks the falls. It’s warm and inviting and obviously luxurious, plus it offers an exceptional gift shop. The lodge would be a lovely, indulgent place to spend a couple nights to celebrate a special occasion. I’d also be happy to enjoy a meal in their dining room. I already said, but I’ll say it again. Take the trail to the bottom of the falls! When we left Snoqualmie Falls, we headed a bit north to Woodinville. Home to over 100 tasting rooms, this is Columbia Valley wine country. If it were just Blake and me, we would have toured more wineries, for sure. But I knew our girls wouldn’t appreciate that very much. 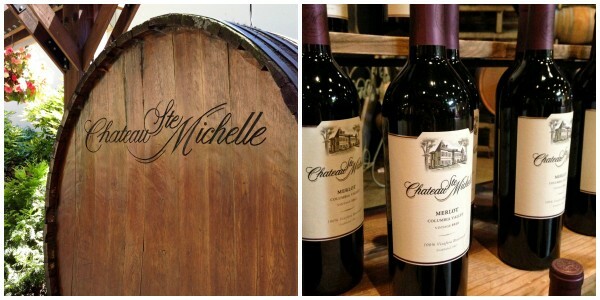 So I chose to visit just one, the oldest winery of Washington State, Chateau Ste. Michelle. Located on a beautiful, sprawling estate, this place has an Old World feel. We took part in a short winery tour and tasting, of which I’d recommend. There’s also a pretty remarkable wine shop on site. A blogging friend who lives near Woodinville (and works at Boeing) recommended we stop in at Red Hook, just across the street from Chateau Ste. Michelle. If you’re into beer, this is a great stop. I ordered a tasting flight and found a number of very likable brews. 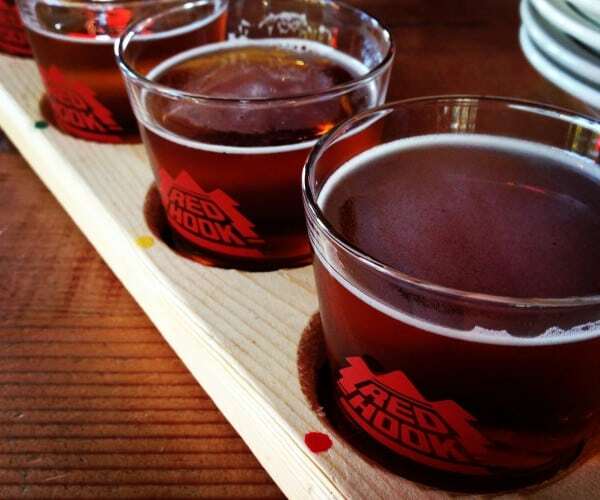 Red Hook offers brewery tours and a full menu, too. Woodinville is FULL of winery tasting rooms. We barely touched on all there was to offer here. If wine is your thing, plan to spend a whole day in this area. We almost decided not to make the 5o-mile trek south to Mount Rainier National Park, but I’m so glad we did. Considered one of the most dangerous volcanoes in the world, Mount Rainier is the highest mountain in Washington and the Cascade Range, with a summit elevation of 14,411 feet. The picture above was taken from the Summit House restaurant at Crystal Mountain Ski Resort. 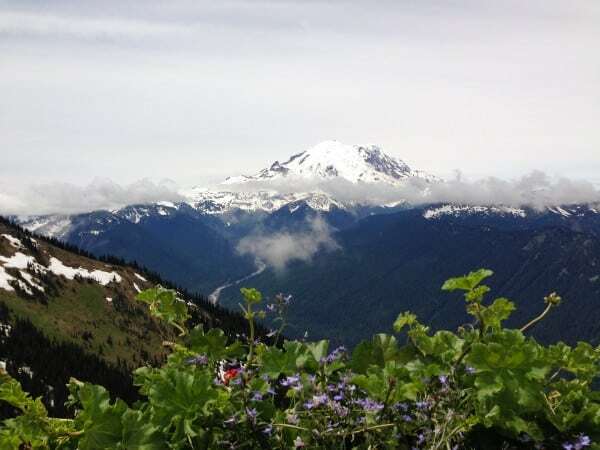 Had we not stopped outside of Mount Rainier National Park’s northeast entrance near Crystal Mountain, we would never have seen the peak of the mountain that day because of the clouds. We rode the ski gondolas up through the fog to the Summit House, where we got above the cloudy cover, to witness Mount Rainier in all its glory. It really was quite awesome. 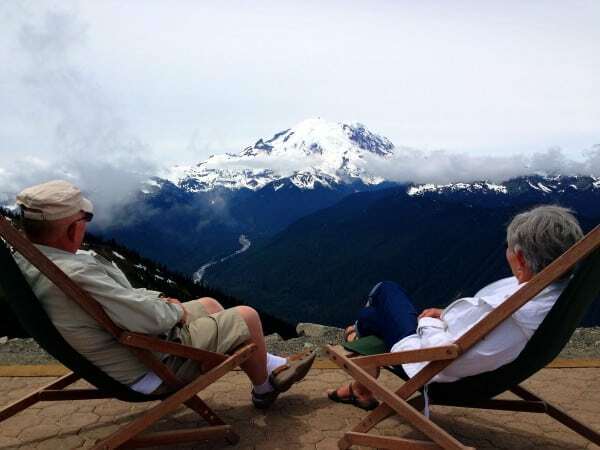 We ate a casual and very tasty lunch at the Summit House, with a front row seat to the mountain. Then we stepped back outside for a few more photos. It was chilly up there! This is one of my favorite photos from our trip. I caught my dad gazing at the mountain from a canvas sling chair. So I pulled up a chair for Mom and snapped a shot. If you’ve ever been to a large National Park, you know how much time it takes to get around, and how many places there are to stop and hike and ponder nature’s amazingness. We barely touched on all there is to see and do at Mount Rainier, but one stop I’d recommend is the Grove of the Patriarchs. 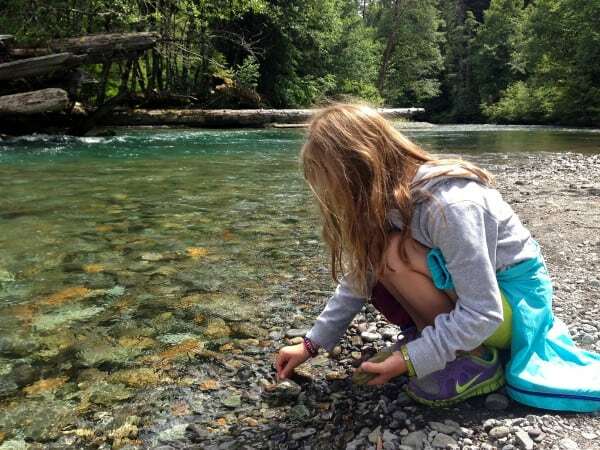 Our girls were content to just play by the river’s edge, picking smooth stones from the frigid, super clear water. 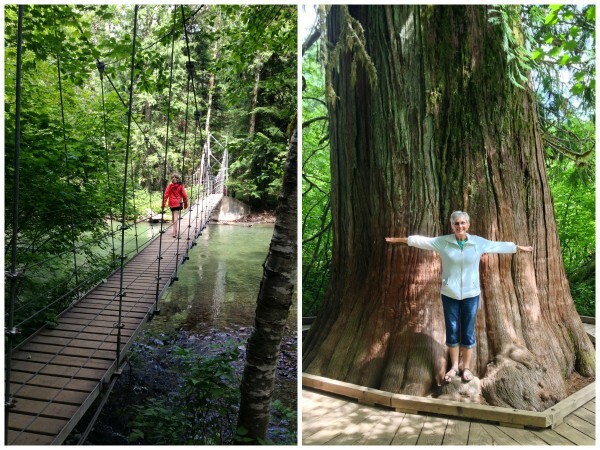 This trail offers an easy, short hike through MASSIVE ancient trees, some nearly 40 feet in diameter and more than 300 feet tall. There’s also a pretty little 1-person-at-a-time suspension bridge. Be sure to walk over this bridge to witness the biggest tree in that area. I always love the old lodges at the National Parks, so made sure that we stopped in at Paradise Lodge on our way out of the park. We visited the park on a cool, cloudy day, when a sweatshirt sometimes didn’t offer quite enough warmth. But inside the lodge, the huge fireplace was burning, welcoming, with guests relaxing around it. If I ever visit this park again, I’d love to look into spending a night or two right in the park. 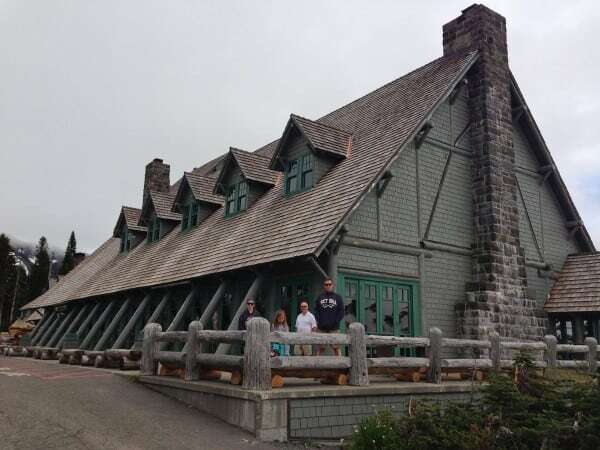 This location is also home to the Henry M Jackson Memorial Visitor Center, which offers casual food service and a gift shop. It took us almost 2 hours to drive each way, from the downtown Seattle area to the park’s entrance and back. If you want to explore the park in one day, get going early so you can make the most of your time. The roads are winding inside the park, and driving is at a slower pace. Have realistic expectations about how much time it will take you to get through the park. The park offers very little opportunities for eats, so pack some water and snacks. When I pre-reserved seats for our family to ride the ferry to Victoria, BC on Vancouver Island, I had no idea it was actually on Canada Day (celebrated July 1st of each year). What a treat it was for us to experience the patriotism of this day with our northern neighbor! There was live music and entertainment everywhere, vendors on the street, and the local Canadians were easily spotted by their red maple-leafed t-shirts. The girls even got a picture with the Mounties in front of The Empress. I regret not having time to explore the Parliament of Victoria. Our daughter’s teacher had recommended to visit while it was in session, but our timing didn’t work out. Those roses on the right lined one edge of the Parliament’s lawn. Spectacular! 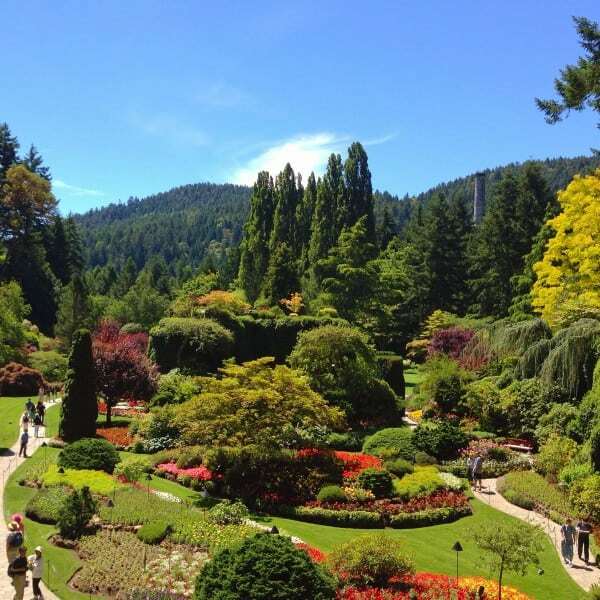 We spent a good amount of our day about 14 miles north of Victoria at Butchart Gardens, lush and abundant with color. 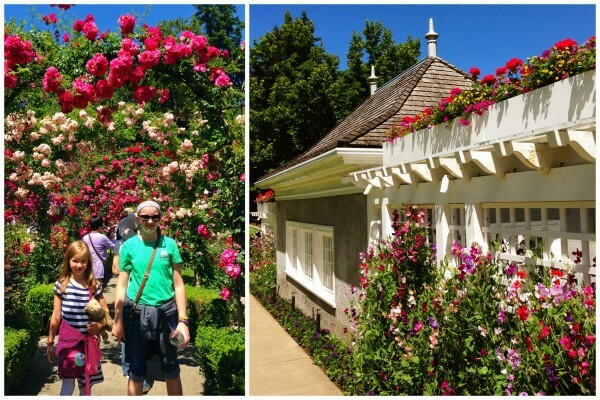 If you love a splendid well-tended garden, make this a priority when visiting Victoria. My favorite space was the Sunken Garden (above), cradled within the walls of an old quarry. The roses. Can you smell them?! I can’t begin to explain how magnificent the Rose Garden was. Before boarding the ferry back to Seattle, we sat along Victoria’s waterfront and ordered some fresh fish and chips. I’d say it was the perfect (delicious) send-off. 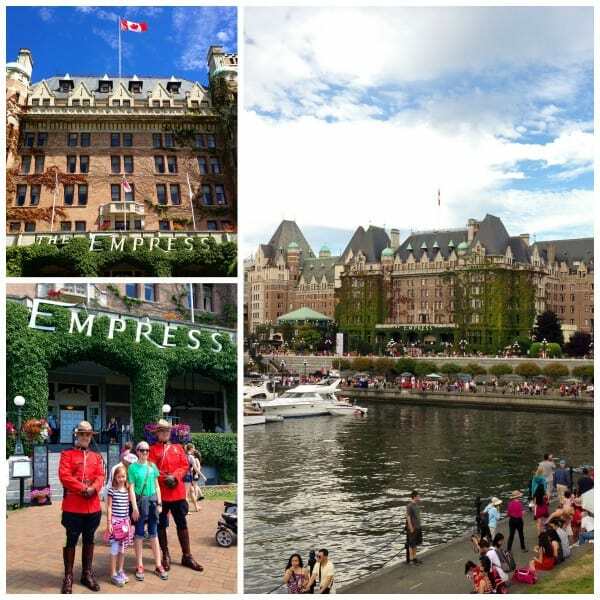 If we ever get back to Victoria, I’d love to take in Afternoon Tea at The Empress. It’s a bit spendy, but the hotel is quite grand, steeped in tradition. I think it would be a lovely experience. This is where I wrap up our trip to Seattle and bring it full-circle, back to Tom Douglas and those amazing peanut butter sandwich cookies I shared with you at the beginning of this post. There is so much good eating in Seattle, but I can’t help but call out the restaurants that we visited by Tom Douglas, because each and every meal was awesome. 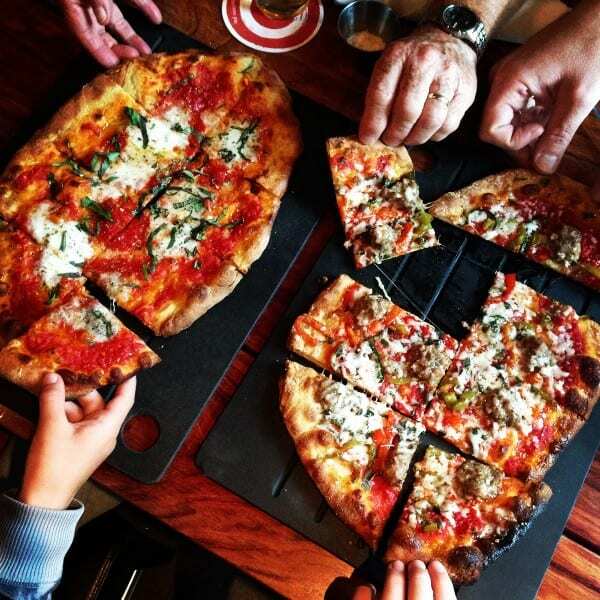 The pizza above was enjoyed on our first evening in Seattle, from Serious Pie & Biscuit on Westlake Ave. There are a couple other Serious Pie locations, but this one was closest to our hotel on Lake Union. When I think of the best pizza I’ve ever had, Serious Pie is a top contender. They also offer a variety of local brews, plus house made root beer and grape soda. This is where our youngest daughter learned to love root beer. We also stopped in at Dahlia Bakery to calm a snack attack. I ordered a mini triple coconut cream pie bite (slices of this pie are a signature dessert at Douglas’ restaurants) and a peanut butter sandwich cookie. Because I just had to see what all the hype was about. Just trust me. 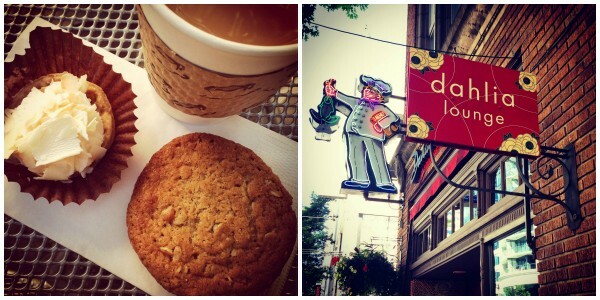 Seek out both of these desserts when you’re in Seattle. Dahlia Lounge is right next door to Dahlia Bakery, and this is where our family enjoyed a special dinner together one evening. The service and experience were wonderful, just like our meal, from beginning to end. Dad and I each ordered the 5-spice duck that I had read so much about, and this tender, perfectly-spiced dish did not disappoint. I really feel that you just can’t go wrong by choosing any Tom Douglas restaurant while in Seattle. We visited just a few of them. Please let me know of your experiences! When visiting Serious Pie & Biscuit, be sure to head upstairs where you can look down on the bakery on the back side. When it’s in progress, it’s great baking entertainment. If you see crème caramel on the menu, order it! We shared this lovely custard dessert at Dahlia Lounge. It’s wonderful. Don’t skip the peanut butter sandwich. I repeat. Do not skip the buttery peanut butter sandwich cookie! Your family and my family were in the same area at the same time. You saw some beautiful locations. We will have to do some of the things you did next time. Oh and those cookies? Can’t wait to make them. That filling is irresistible!! I hope you get to Seattle some day, too. The market photos are my favorite. It is so cool to see what is blooming in Seattle when I am in Washington, DC, on the other side of the country. These cookies look super dangerous; like peanut butter oreos. Yum! Awesome, you were in my neck of the woods! :) So many great things to do in Seattle and we were just in Victoria two months ago. Great photos and such yummy cookies! First of all, those peanut butter cookies look and sound amazing! 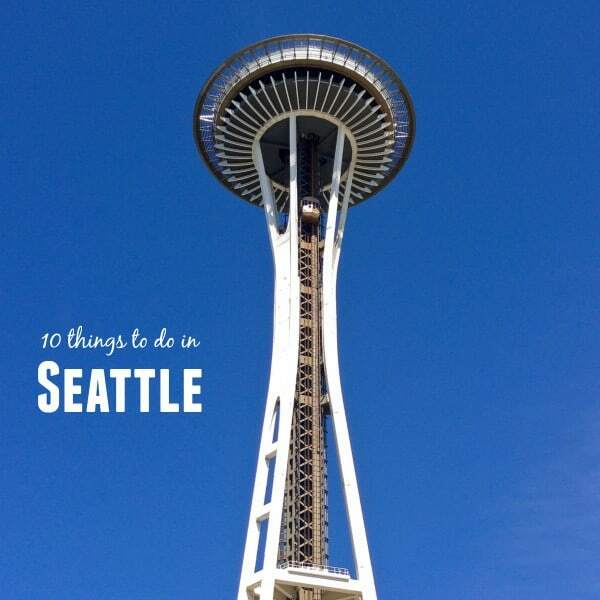 :) And second, what a great list of must-dos for Seattle! 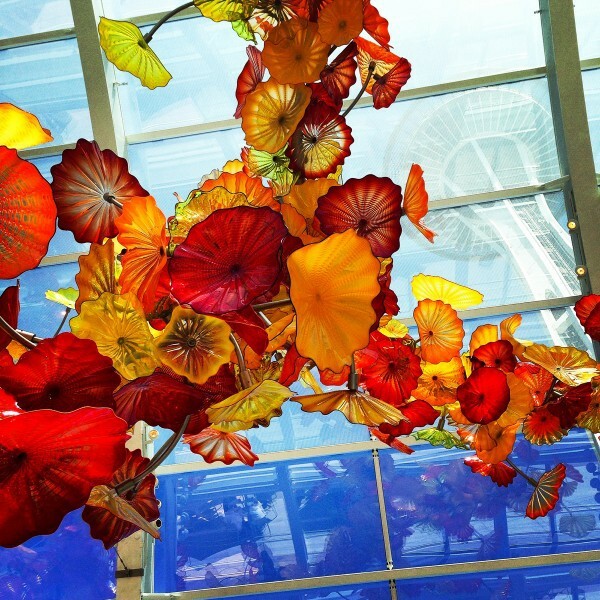 Chihuly’s work is amazing! I fell in love with his pieces when I lived in Columbus, OH. :) I have to be honest- I don’t really get the gum wall? lol! That just seems kind of gross to me. What an awesome trip! 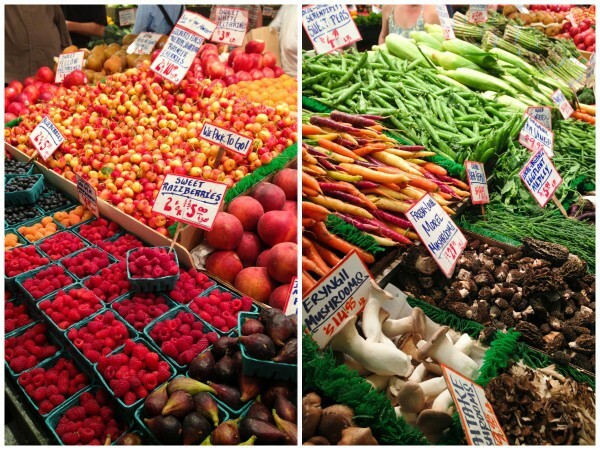 I want to go to Pike Place Market soooo Bad!!! I wish there was something like that in my area. Oh, those pb cookies look pretty darn good too! All of your pictures are gorgeous, they make me want to go to Seattle right now! These cookies really do like the best ever! Wow, this post brings back so many memories. I used to live in Seattle and I am long overdue for a visit sometime soon. Hope you enjoyed your trip! Looks like you had a great time. :) Btw, these cookies are amazing! So delicious. Love your post Brenda. It is so fun to remember the great time your Dad and I had with you last summer. We sure did enjoy the food, didn’t we!! Especially those cookies, and all the other outstanding Tom Douglas eats. Thanks for the memories!! I have this book and it’s one of my TOP TEN fave baking books. Everything in it is awesome and no-fail! You are going to love that book so much. My pages are food smeared and filthy – well loved. I actually have a trip planned to San Juan soon with a stop in Seattle. I’ve been there recently but it’s good to have a couple more ideas! 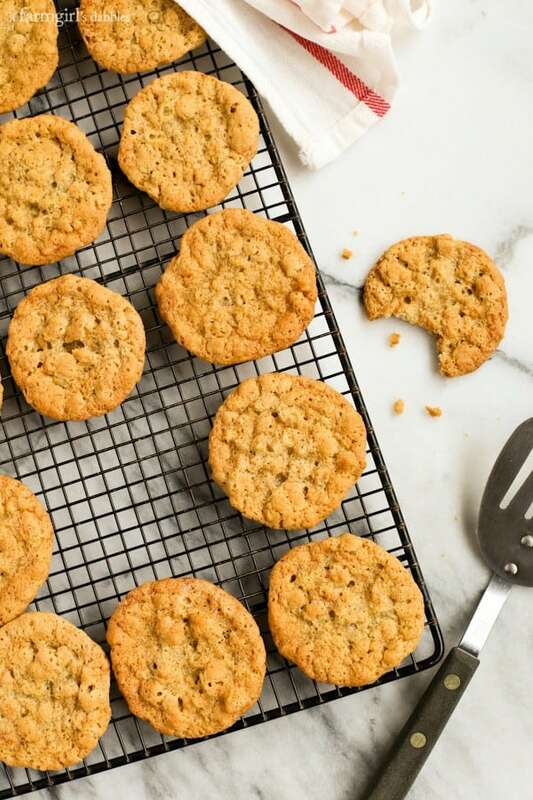 First off – these seriously do look like the best cookies! I love how there is both crunchy and creamy peanut butter involved, so that settles the crunchy-creamy debate! As for Seattle – what a great town! My husband wants to retire there, and I finally had a chance to visit last year – such fun! I think I hit most of the stops, but didn’t have enough time to venture outside of Seattle to hike or wine taste, so obviously, a return trip must be planned! So glad you shared these cookies – hope to make it very soon. 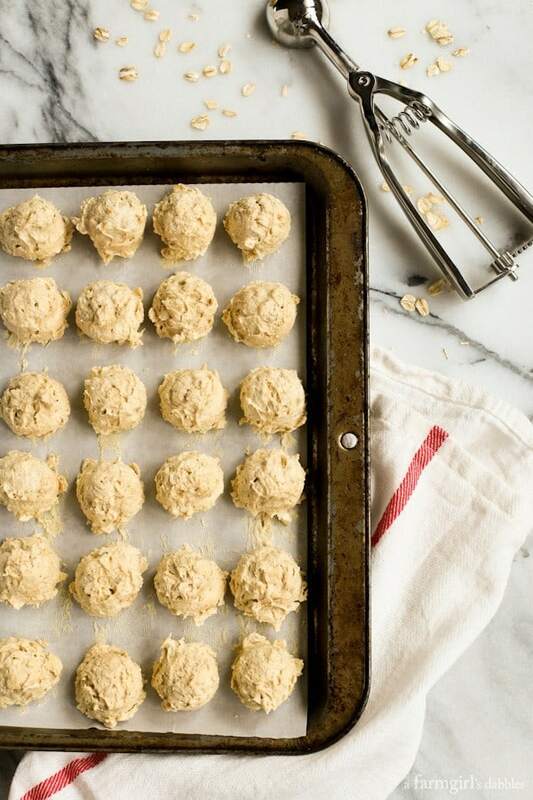 Your cookies look divine—you can’t beat a Tom Douglas recipe! We lived in Vancouver for a year, so I quickly became a fan of the PNW. 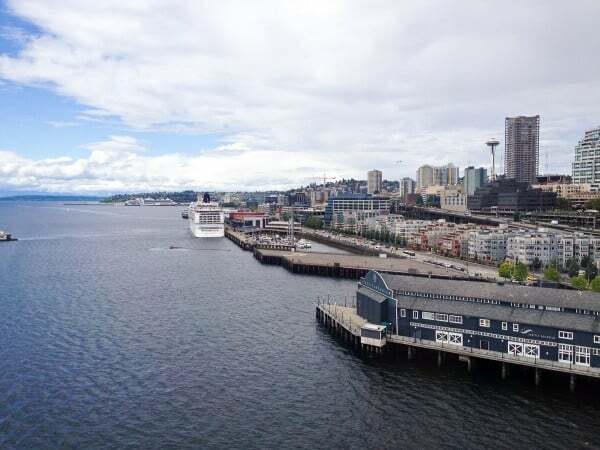 I adore Seattle and Victoria as well—and love the stops you made on your trip! 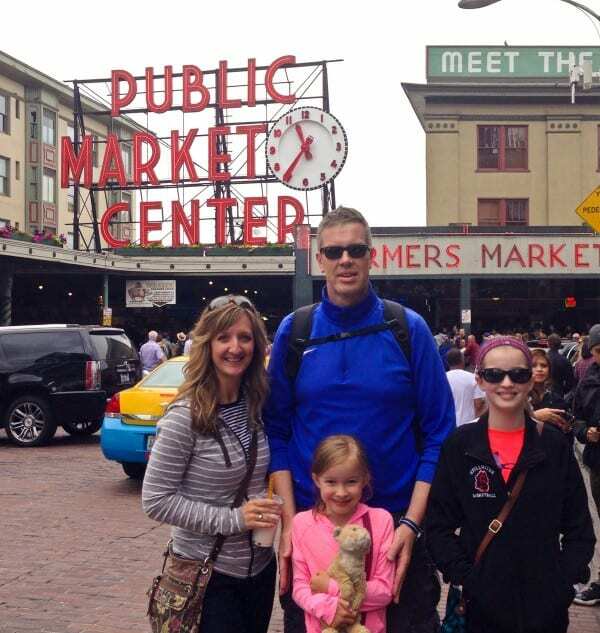 What a great trip and a great experience you had last summer in Seattle with your family. As for those cookies, why the double pan baking, do you know? Just wondering as I have never used that process before when baking cookies. Man! You packed it in! 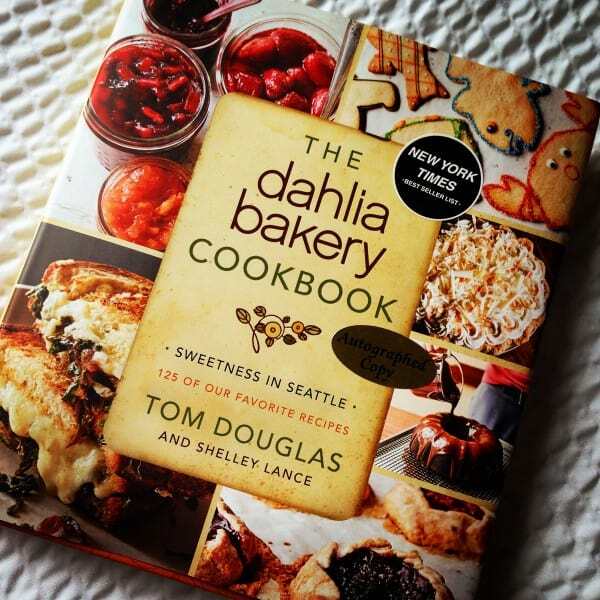 Tom Douglas is the epitome of Seattle cooking and after my aunt gave me one of his cookbooks, I’ve been enjoying the fare at home too. 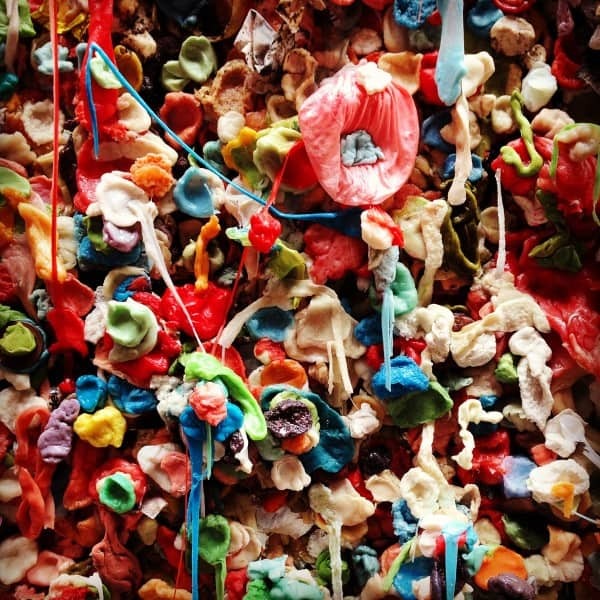 The Chihuly Gardens and gum wall were a big fave of ours. Can’t wait to get back to Seattle this summer! 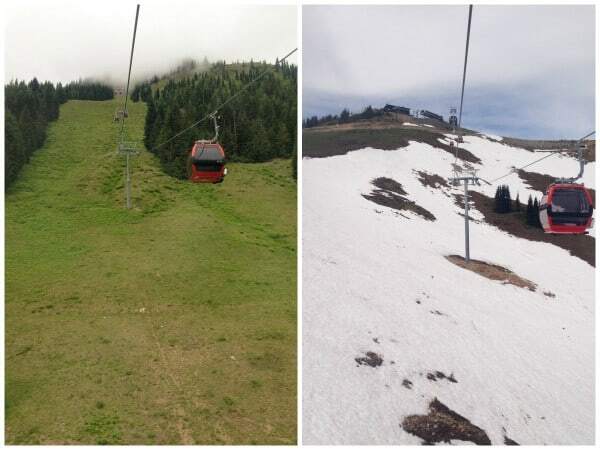 OK…you are really making me want to go back! 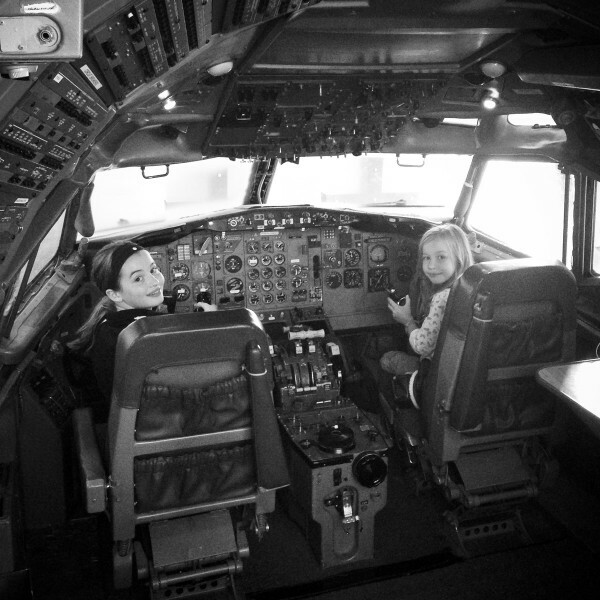 We didn’t hit everything on your list, but we did LOVE that Boeing tour! So fun! I discovered Tom Douglas on our trip, through Teresa from Blooming on Bainbridge. In LOVE with all that he does! Can’t wait to try these cookies! 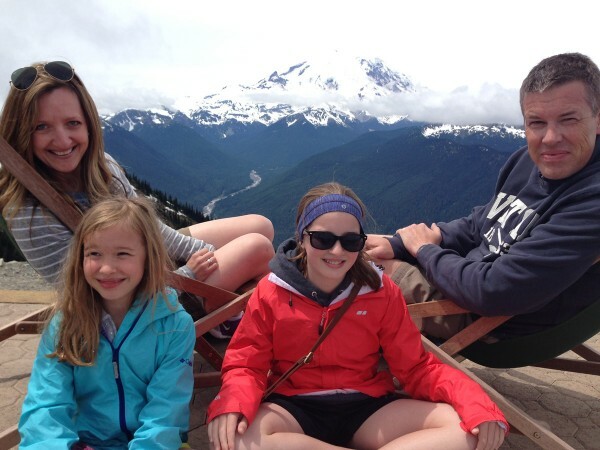 You are making me homesick for the Pacific Northwest with all of these photos! I’ve always heard amazing things about the Dahlia Bakery. Now I need to make these cookies at home to hold me over until I can make a trip there.